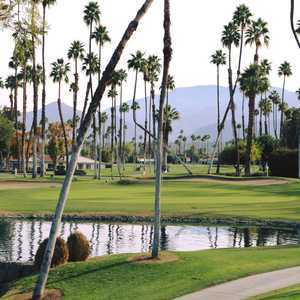 Rancho Las Palmas Resort & Spa offers 27 holes of championship golf. Divided into three nines: North, South, and West, the courses are played in three different 18-hole combinations. The South/West Course enjoys the snow-capped Mount Jacinto as a backdrop. Thousands of palm trees cover the rolling terrain and there are six lakes that come into play throughout all three courses. There are also strategically placed bunkers along the greens. The West nine's third hole is possibly the golf course's toughest. It's lengthy at 645 yards and it presents a challenging third-shot approach to an elevated, double-tiered green. The layout offers a few challenging holes but it is still quite player-friendly. In addition to the scenery and playability, another attractive quality is that a round can be played in less than four hours.